A good way of trying out one of our devices thoroughly before you buy is our Test Hire option. The hire price is deducted when you buy a new machine of the same type. Each of our machines comes with comprehensive operating instructions. If wished, our experienced engineers can also give your employees on-site training. Ensure the precision of your valuable measuring equipment by regular calibrations. Customers with a Maintenance Contract receive priority treatment. 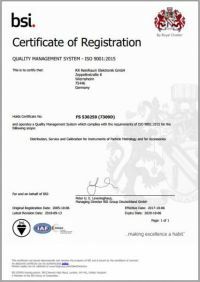 Our reference machines are specified on the calibration certificate. Of course we will also calibrate machines made by other manufacturers. We will service your equipment on your premises or at our laboratory in Wiernsheim, as you require, so that you can have it back in operation as soon as possible. Naturally we can provide you with hired equipment to cope with bottlenecks. If you have questions about our service conditions or the availability of equipment for hire, we can answer them in direct dialogue. We look forward to your enquiry.